The VF480 and VF570 supercharger systems for the E46 M3 (2001-2007) are capable of sustained performance over a variety of challenging parameters. The VF M3 S/C Race Water Intercooler was designed for racers looking to boost to compressor efficiency by spreading the thermal load over a much larger surface. Sustaining full throttle through 4 gears without releasing throttle requires tremendous design tolerance not only in the fuel management but also in the charge cooling department. The lower the charge temperature, the better the performance. After extensive data logging with independent thermocouples throughout the air system, VF-Engineers found that upgrading the water cooler radiator kept air temps down through successive gears and not just a dyno pull in a single gear. Analytics can be catered to show benefits of an upgrade, but we put this system to test on 16-19 psi supercharger setups to explore its potential. Positive results meant that we introduced this product immediately for the 6-10psi kits and not just the fully race built engine kits. This upgrade is fully compatible for aforementioned systems and available to as an upgrade to replace your existing “street” radiator originally supplied with your VF-Engineering supercharger kit. The radiator shown in the image is the item described. VF-Engineering’s High Performance Oil Cooler offers a huge increase to the thermal tolerance of the M42 engine. 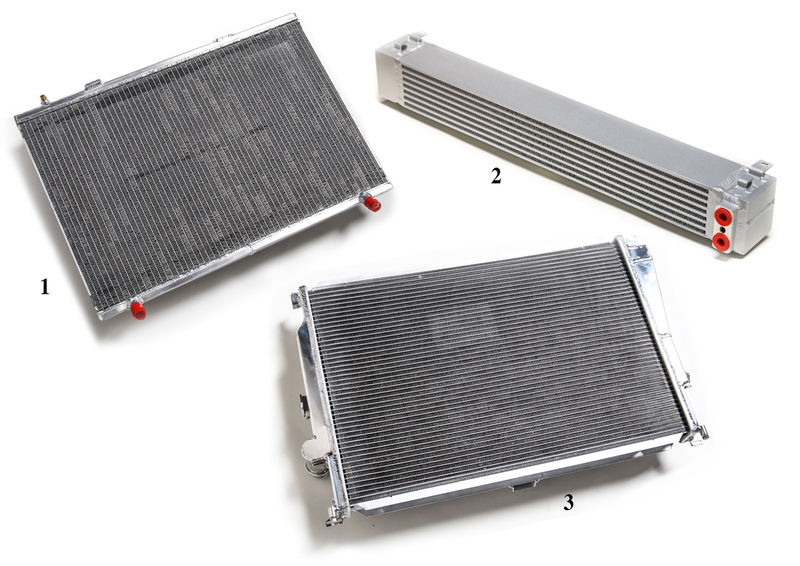 With almost twice the surface area (1.3m² vs. 2.4m²) of the factory oil cooler, racers and aggressively driven street cars will never again see destructive oil temps during spirited use.Typically, E46 M3 oil temps remain within thermal limits during normal driving and the factory oil cooler does a decent job. Under sustained load however, the factory cooler quickly reveals its limits (talk to anyone who tracks their E46 M3). Temperatures rocket and oil starts to break down, which is a bad thing. Designed just down the road, VFE’s High Performance Oil Cooler is a direct bolt-on replacement for the factory unit with pre-tapped inlets and mounting tabs. The cooler features robust, welded end caps, smooth internal passages and a very clean, powder-coat-like finish. Based on its performance and quality, this oil cooler is a great addition to a VFE M3 supercharger system. Crafted from military grade aluminum, VFE engine coolant radiators surpass any other radiator on the market for quality and durability. Each radiator undergoes the most testing we’ve ever seen, with everything from burst pressure to wind tunnel testing, CSF demands the most out of their radiators to ensure they are the best performing and highest quality radiator you can buy. Each radiator is designed to have drop in fitment, and require no modifications for installation. CSF even ensures their packaging is the best. Each package is built to withstand a 10 foot drop to make sure that when you get your radiator.